These past few weeks have been an exciting time for those of us who are fans of Greyson Chance. His recently completed trip to Asia gave us all kinds of new interviews, funny moments and great performances. Of course, the biggest news for fans was the release of the new EP Truth Be Told – Part 1. Almost 15 months after the release of his debut full length album Hold On ‘Til The Night, Greyson is back with 5 new songs (and 1 new official remix) which he has released as a precursor to his second full length album which we hope to see released sometime next year. Unfortunately, due to budget constraints, Truth Be Told – Part 1 has only been released in some markets with other countries (most notably, the U.S.) not expected to see the release of the EP until early 2013. However, we at ‘Til The Night | Home of The Greyson Chance Forum have obtained a few copies and want to give them out to our members! 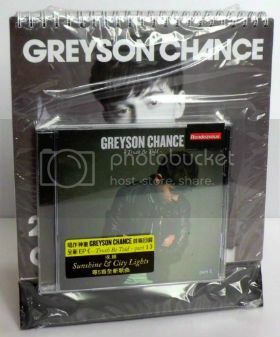 We will select 5 winners to receive a physical copy of Truth Be Told – Part 1 along with a 2013 Greyson Chance calendar. We will also select 5 additional winners to receive a copy of the U.S. version of Greyson’s debut album Hold On ‘Til The Night. (1) Log in to your account on The Greyson Chance Forum, or if you haven’t joined yet, CREATE an account. II. If you could give Greyson a gift of anything in the world for Christmas, what would it be and why?